Whip up a batch of gluten-free blueberry oat pancakes – with lemon maple syrup – and you can skip the side of guilt. Naturally sweet, with low sodium and no added sugar, this delicious take on a breakfast favorite fills and fuels the whole family for a busy day ahead. 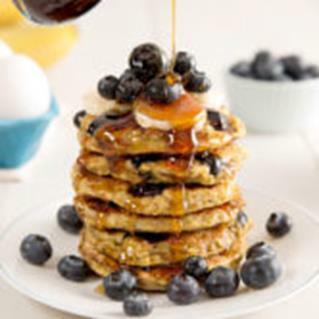 Best of all, these gluten-free blueberry oat pancakes are quick and easy to make. Mix, cook, enjoy! Combine banana, eggs and oats and let stand 10 minutes to thicken. Spray a large non-stick skillet with cooking spray and heat over medium heat. Spoon mixture, 2 tablespoons at a time, onto skillet and top with some of the blueberries. Cook until browned, 1-2 minutes. Turn and cook additional 1 minute or until cooked through. Combine maple syrup and lemon zest and serve with pancakes, if desired.